Kolkata’s real estate clocked an average rise of three per cent in Jan-Mar 2015. Improved connectivity proffered by the development of the metro, despite the frequent delays in infrastructural development and demand-supply mismatch kept the market upbeat. Recording an average rise of four per cent, East Kolkata was the frontrunner, followed by North Kolkata which witnessed a three per cent growth. While property prices in South Kolkata rose by two per cent, that of Central Kolkata depreciated by one per cent. The chief influencer of the Kolkata realty landscape is the metro network which, when complete, will connect the North-South and East-West zones. Establishment of IT-ITES firms in East Kolkata and revival of the Bonhooghly project has lifted the real estate story of the city which had seen a dip of two per cent in Oct-Dec 2014. A Cushman & Wakefield report stated that in the forthcoming five years, Kolkata will see a staggeringly low demand of residential units of less than a lakh. This is primarily due to the disparate demand and supply. While supply will be high in the middle income group (MIG) segment, demand will be maximum in the affordable bracket. The Eastern Metropolitan (EM) Bypass which once garnered a lot of attention has been witnessing a lukewarm response from buyers lately. The builder fraternity attributes this trend to the general slack in real estate absorption and expects demand to pick up after the Parama flyover is constructed. Baranagar, the highest gainer this quarter, is riding on the wave of metro connectivity despite the Baranagar- Noapara-Barrackpore metro rail link hitting a land hurdle. Revival of the Bonhooghly residential project, situated at a distance of less than 4 km, is a major growth stimulator. 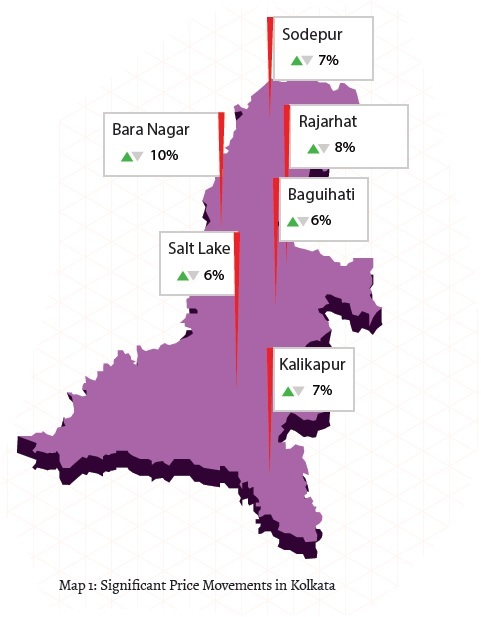 Rajarhat witnessed a spike of eight per cent in Jan- Mar 2015. In Oct-Dec 2014, property prices here had depreciated due to the government’s refusal to grant SEZs to corporate houses. The turnaround was possible in the wake of the governmental grant of 10 per cent floor area ratio (FAR) in addition to the usual FAR for residential constructions following green norms. Kalikapur, located off the EM Bypass, owes it buoyancy to the proposed New Garia-Biman Bandar metro line which is under construction. Kalikapur will have a station in this metro corridor, which will greatly reduce travel time to Netaji Subhas Chandra Bose International Airport. Despite being congested, Sodepur owes its popularity as a residential hub to the local suburban train and the proposed metro network. The locality will be a part of the Baranagar-Barrackpore metro corridor. Baguihati in North Kolkata recently saw the completion of a four-lane flyover linking Kestopur with Raghunathpur spanning 2.23 km, over the VIP Road. While this flyover would reduce traffic snarls between Ultadanga and the Airport, Baguihati will get a new underpass. In addition, the VIP Road is scheduled to be widened further starting from Baguiati towards the airport. 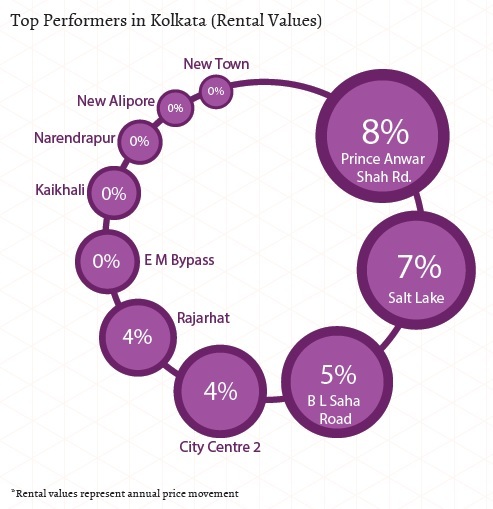 The rental market in Kolkata grew by two per cent in the last one year, with Prince Anwar Shah Road in South Kolkata taking the lead. In December 2014, the state government had modified the Kolkata Municipal Corporation Act, 1980 in a bid to reduce tax burden on property owners and encourage them to put their houses on rent. Prior to this, property tax was calculated in accordance to Actual Rent system. The new system which calculates tax according to the Reasonable Rent process, cut the tax component of rented homes to half, thus boosting the rental market. All the regions in the city witnessed improvement in rental values. North Kolkata saw maximum appreciation of four per cent. 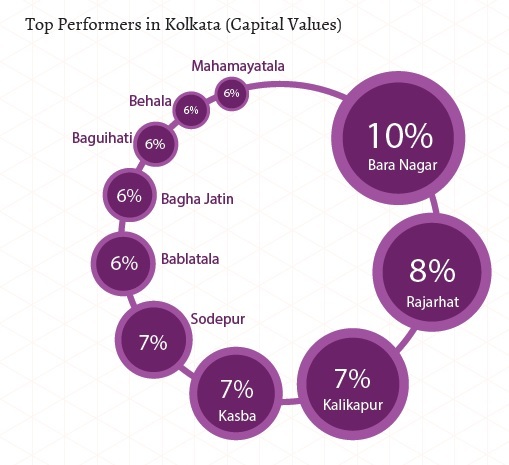 Both South and East Kolkata witnessed an average rise of two per cent in the rental values, since Jan-Mar 2014. 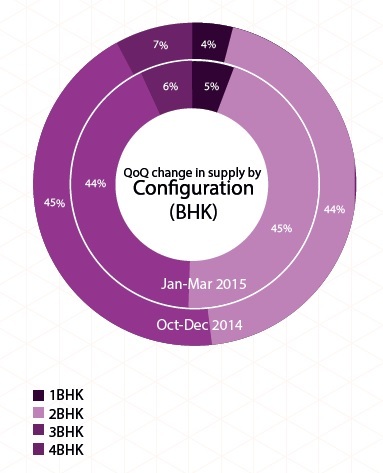 Rental rates in Prince Anwar Shah Road surged four times in Jan-Mar 2015 from two per cent in the previous quarter. Increased momentum of commercial activities and the state government’s proposal to repair the connector takes credit for the uptrend. The construction of the East-West Metro in Salt Lake’s Duttabad has led to a surge in rental prices by seven per cent. In addition, this locality houses a number of IT firms in sector-5, and is situated at a convenient distance of 13 km from the Airport and 11 km from Rajarhat. With a well-developed IT hub in the eastern region of Kolkata and increased momentum of commercial activities due to the promise of connectivity by the metro, the city recorded maximum supply for residential apartments configured as 2 and 3BHK units. Supply of various property types such as residential apartments, builder floors and independent houses/villas in Kolkata saw slight variations in Jan-Mar 2015, as compared to the preceding quarter. While residential apartments continued to be the most popular choice, hence, available property type in the city, its supply dropped by six per cent in the current quarter. From making 91 per cent of the total market share in Oct-Dec 2014, apartments made up about 85 per cent of the market share in Jan-Mar 2015. Builder floors and independent houses/villas made up only 15 per cent of the entire market, with builder floors taking the lead with nine per cent market share. This was a rise of five per cent from the Oct-Dec 2014 quarter. Independent houses/villas continued to be the least supplied in the city with only six per cent market share. While supply of mid-income housing category of Rs 25-40 lakh and ultra luxury housing category of Rs 1-5 crore saw marginal variations between Oct-Dec 2014 and Jan-Mar 2015, supply of properties in the affordable housing segment (within Rs 25 lakh), high income housing segment (Rs 40-60 lakh) and luxury housing segment (Rs 60 lakh - Rs 1 crore) remained consistent in consecutive quarters. Supply of properties in the mid-income bracket (Rs 25-40 lakh) continued to top with 27 per cent market share. However, the segment saw a slight dip of one per cent since the Oct-Dec 2014 quarter. More than 50 per cent of these units remained under construction, with about 46 per cent being ready-to-move-in. Being the most affordable of the four major metros in the country, properties below the price range of Rs 25 lakh saw the second highest supply in consecutive quarters. About 53 per cent of these units too were under construction in Jan-Mar 2015. The high-income segment of Rs 40-60 lakh was the next most supplied with almost 21 per cent of the total market share. The category saw a balanced availability of these in the under construction and ready-to-move-in states. Supply in the ultra luxury bracket continued to remain the least in the city, however, it increased by two percent in Jan-Mar 2015 as compared to the previous quarter, capturing 13 per cent of the market. Close to three fourth of these units were available to occupy. With majority residents of the city being the localites of Kolkata looking for mid-budget properties, the city saw maximum demand, and thus, supply for 2BHK and 3BHK units. While the availability of 2BHK units inched up marginally in Jan-Mar 2015 and stood at 45 per cent, supply of 3BHK units dropped marginally and stood at 44 per cent. Both the categories had more than half (52-53 per cent) of their inventory available in the ready-to-move-in state. Other categories -1BHK and 4BHK units recorded insignificant supply of five to six per cent. 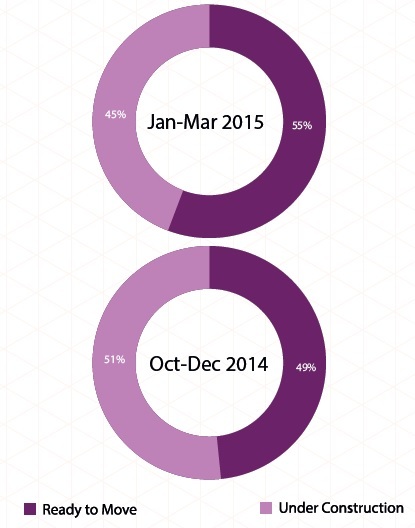 Oct-Dec 2014 had seen a spurt in new launches due to the metro expansion work and improvement in road infrastructure. 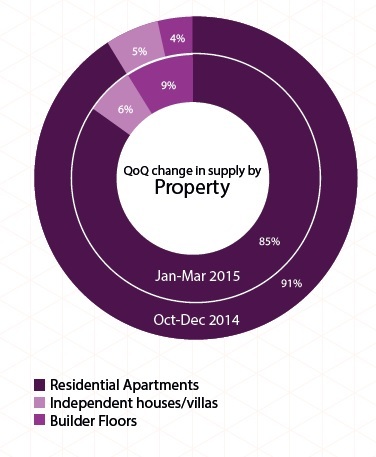 The quarter saw 51 per cent inventory being under construction. However, in Jan-Mar 2015, number of new launches slowed down and there was a drop in under construction properties by two per cent. This quarter saw more of ready-to-move-in properties. 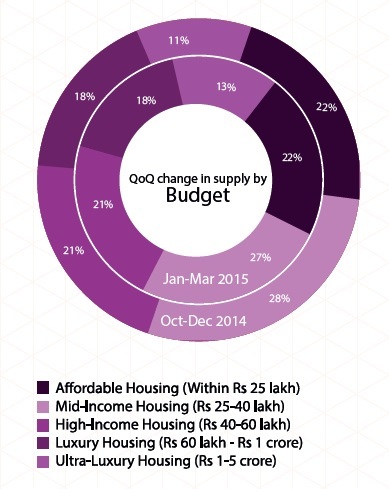 Supply in the category increased to 55 per cent from 49 per cent in the Oct-Dec 2014 quarter. Out of the total under construction properties, majority of them (32 per cent) were seen mushrooming in the price bracket of Rs 25-40 lakh. Affordable homes priced within Rs 25 lakh and high-income category homes priced between Rs 40-60 lakh had an almost equal number of units being constructed in this quarter. Both the categories made up 22-26 per cent each of the total under construction homes. Smaller 1BHK units and larger 4BHK units were the least popular amongst developers and thus, made up only four to five per cent of the total under-construction properties.